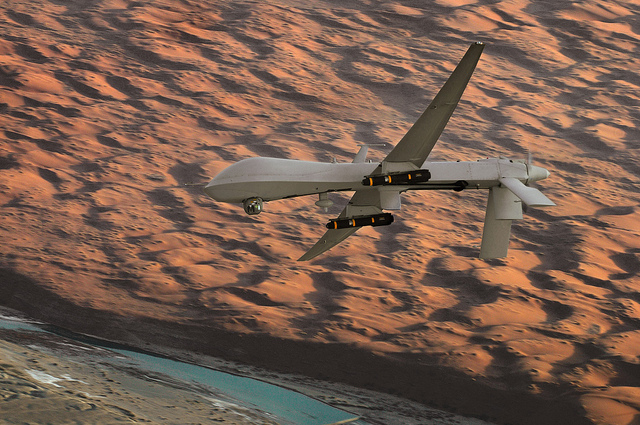 An MQ-1 Predator unmanned aircraft, armed with Hellfire missiles, flies over southern Afghanistan. Photo by Charles McCain via Flickr. In the late 1980s, Vietnam veteran Brian Willson sued the U.S. government after being maimed by a Navy munitions train during a protest against U.S. wars in Central America. During trial preparations, the U.S. attorney subpoenaed and deposed several of us who had been at the demonstration or were involved in local organizing. Thus began an 18-month ordeal focused on what we viewed as improper government information-gathering, which came to a close only after Willson reached a settlement in his case. In my sworn deposition I willingly shared my experience of that horrendous day. But when the interview turned to questions about the internal operations of the organization I worked for at the time — The Pledge of Resistance — I respectfully refused to answer. I was asked for details about how the organization operated, its membership, its meetings, and about the people who attended them. Supported by two lawyers from the Center for Constitutional Rights, I declined to respond. I felt that sharing this information would potentially have a chilling effect on our community and our campaign — would people come to meetings if they knew that data about them might end up in a government file? The trust and solidarity that nurtures so much organizing could be jeopardized. Even more significantly, I felt that the government wasn’t entitled to this information. The Pledge had a long history of nonviolence training and nonviolent action. There was no basis, so far as the legal case was concerned, to gather this kind of material. We feared that it could be used, then or in the future, for political purposes. Surveillance of the Central America peace movement was not uncommon — 60 movement offices were reportedly broken into during those years — and we had concerns that the information gathered in these depositions could be part of a larger effort to weaken and derail the nationwide effort to end the U.S. wars in Nicaragua, El Salvador and Guatemala. In the larger scheme of things, we distrusted the reach of the government’s growing ability to spy on ordinary citizens. For the next year and a half, then-Pledge staffer Darla Rucker and I were hauled into additional depositions. The Justice Department finally got a federal judge — Gerhard Gesell, who had presided over the trial of Iran-Contra operative Oliver North — to issue an order of contempt of court, which was stayed pending the disposition of Brian’s case. When the case was settled, the contempt of court order was mooted, and we were able to go on about our business without the possibility of an indefinite jail sentence hanging over us. From the vantage point of nearly a quarter century — the 25th anniversary of Brian Willson’s arms-shipment protest will take place September 1 — this legal skirmish seems positively quaint. Our post-9/11 world is, of course, replete with a surveillance infrastructure — and the legislative armature to authorize and sustain it — that far-outstrips any such capacity the U.S. had previously. There are so many aspects, it’s hard to know where to focus. Perhaps data-mining? The National Security Agency (NSA) is building the United States’ largest surveillance center in Utah, which will contain vast databases to store all forms of communication, including private emails, cell phone calls, Google searches and other personal data. Or should the focus be on spy satellites? In 2010, the U.S. Air Force launched its largest electronic eavesdropping satellite, whose mission is said to be to tap into targeted military or civilian communications networks for data collection by the NSA. What about domestic eavesdropping? Thirty thousand people are paid to listen in on phone conversations and other communications within the United States. Then there’s the thrice-renewed Patriot Act, which has expanded the government’s authority to spy on U.S. citizens. But the rising star of our emerging Surveillance Nation surely is the drone — in all of its many shapes and sizes. Is it just me, or aren’t there an awful lot of drone stories out there at the moment, bombarding us like, well, a kind of simulated drone attack? If the original nickname came from the word for a drudge who does tedious or menial work (keeping the rest of us from dirtying our hands), maybe with this recent onslaught of news reports and seemingly new public banter we’re verging on another connotation: a continuous, low, dull humming sound. Recently the Obama administration accelerated its public relations campaign to sell the American people on the perilous concept that drones and peremptory executions are legal and effective — and are here to stay. We’ve recently been treated to a high-sounding (though still strangely monotonous and self-serving) justification for drone warfare by the Obama administration’s point-person on all things drones (including targeting), U.S. counterterrorism chief, John Brennan. Brennan’s statements were meant to provide a public rationale for targeted killing, but it has broached the squeamish fact of sanctioned assassination in a way that hasn’t been publicly acknowledged since the Church hearings in the mid-1970s. These comments seem to have opened the floodgates for reporting, commentary and the beginning of what passes for debate today. For example, in the last two days the Pew Research Center reported that in 17 out of 21 countries worldwide more than half the population opposes U.S. drones strikes; Wired magazine reported that 64 drone bases exist on U.S. soil; and a backpack drone, called the Switchblade, is now being used in Afghanistan; and Huffington Post reported that the U.S. military wants more drones in Latin America. These stories are in addition to the news of a drone strike in Yemen that reportedly killed 27 people, and of the consternation sparked by a crash of a drone in rural Maryland this past Monday. I’m afraid that this sharply increased “droning” is designed to accelerate the process of normalizing drones in our lives and our world. There will be much fallout from this globally, both for U.S. policy and for many other countries; we are likely already in the midst of a “drones race,” with counter-measures, sanctions, and new strategic dogmas in the offing. But drones are being here in the United States, too, especially for purposes of (but not necessarily restricted to) surveillance. While another poll published today declares “Americans OK with some domestic drones, but not to catch speeders,” police departments are thinking way beyond writing tickets. While USA Today touts things like finding lost children and easing traffic jams, they are also envisioning crime scenes and “barricaded suspects.” The recent bizarre story of the use of a drone to pinpoint a holed-up cattle rustler in Grand Forks, North Dakota, offered a detailed and long-term relationship between homeland security and U.S. law enforcement. “We’ve had a relationship with Predator operations for three years,” Grand Forks SWAT team chief, Bill Macki, acknowledged. Left to its own momentum, Surveillance Nation has every chance of becoming a reality — unless a powerful movement takes action; finds a way to prompt profound conversation about the meaning and consequences of the “dronization” of the U.S. and the world; and charts a new direction that meets this network of fear-based control with a very different vision of human life. Fortunately, there are movements afoot. Code Pink has organized creative action for years focused on drones; co-founder Medea Benjamin’s new book Drone Warfare: Killing by Remote Control is just out. Retired Colonel Ann Wright, a long-time Code Pink activist, has organized a 30-day presence in front of the White House that began on June 8. And the Baltimore Nonviolence Center has written a letter to President Obama calling on him to dismantle the drones program; organizations are invited to sign on by emailing BNC here. Also, the Nevada Desert Experience has been taking nonviolent action for years at Creech Air Force Base north of Las Vegas, one of the key drone bases in the U.S. But much more is needed. Maybe this renewed focus on drones will spark more serious discussion about the ramifications of a “drone nation” across the political landscape, as a June 12 interview featuring Senator Rand Paul may portend, where he comments on a bill he is sponsoring to ban domestic drones from monitoring citizens. The prospects of domestic spying — including surveillance of nonviolent social change organizations and their members — are dramatically higher today than when some of us resisted government snooping a couple decades ago. But that simply means our work is more important than ever. Together we can join with people across the country and around the world to strengthen and deepen the movement challenging the twin dangers of “on high” information collection and covert action, including targeted killings, in an increasingly dronized world. I remember the guy and the train, because it was a local story. I thought the guy was nuts, but how could someone intentionally run him over? Times change, and some of us change too, but not enough people continue to grow and mature and come to realize the harm this government system we have does. I hope people realize that most all governments will continue to grow and demand more and more while looking for things to do. And, I’d hope non-violent actions will replace our current transmogrified government by any means available. We, the people, still and always will have this proper ability to change our government – overthrow – by replacing it, but it requires a lot of people to do so. Giving up political affiliations is a start. People don’t want to give up their toys. We will go to our graves clutching meaningless little pieces of plastic in our hands, believing we have done our best when, in fact, we have done nothing but succumb to snake oil salesmen and cheap carnie hypnotists.